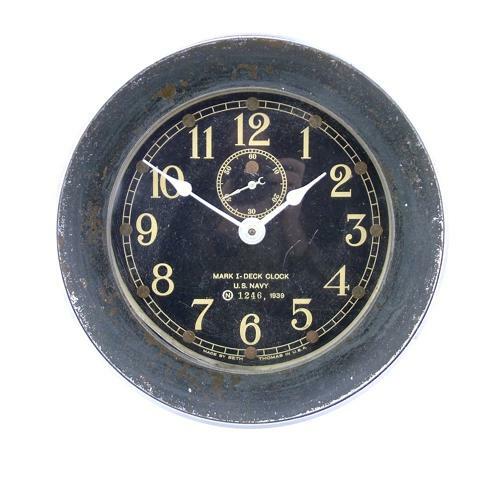 United States Navy Mark I Deck Clock. By Seth Thomas. Serial number 1246, 1939 dated. Approximately 19cm diameter x 9cm depth. Black painted heavy cast white metal case. 14cm (5.5") black painted dial with subsidiary seconds dial. Roman numerals and white painted hands. Platform escapement movement. The clock baseplate would have been bolted to the ship's bulkhead and the movement accessed via the hinged front section. Once opened the movement can be wound, regulated, stopped and the hands set. The clock is in good working condition and is currently keeping accurate time. The case is chipped and the glass has light scratches. Excellent dial and hands. It would have had some form of closing latch/bolt but this is now absent. When we purchased this it was mounted on a crudely shaped wooden shield with an engraved plaque stating that it originated from the USS South Dakota BB-57 battleship. We cannot prove this but have included the information about the battleship below and will supply the plaque with the clock when sold. USS South Dakota was built by the New York Shipbuilding Corporation at the Camden New Jersey dock works beginning in July 1939 and launched on June 7, 1941. She was fitted out at the Philadelphia yard, receiving some of her arms and stores in addition to the balance of her crew. Armament included 9 x 16"/45 caliber Mk.6 main guns, 16 x 5"/38 caliber guns, 68 x 40mm Anti-aircraft guns, 72 x 20mm Anti-aircraft guns and three Curtiss armed floatplane Scout aircraft that could be launched using onboard catapults. These could then be picked up by the ship's cranes on return. Known as Battleship 'X', she began with a tour in the Pacific theatre and was attacked by Japanese dive bombers sustaining a direct bomb strike on the top of her number 1 turret. Credited with 26 Japanese aircraft kills she returned to New York for repairs. During 1943 she joined British patrols (based at Scapa Flow) in the North Atlantic and Arctic Oceans before returning to the Pacific in August 1943 joining various combat operations in readiness for the the invasion of Japan. Having received a US Navy Unit commendation and 13 battle stars after the war she was placed on reserve and later scrapped. A high quality timepeice in good working condition. Stock code C22125.